Every year, thousands of couples get divorced in Texas—and have a much worse time than they need have. Because you don’t get divorced on a regular basis, the process is probably a mystery to you, so naturally you don’t know how to avoid common pitfalls. How can you avoid the mistakes most people make, and get the best possible divorce outcome? Attorney Ed Sherman has just released the latest edition of his book How to Do Your Own Divorce in Texas: An essential guide for every kind of divorce to explain in easy-to-understand language how a Texas divorce works, so you can avoid common traps and get the best possible results, with or without an attorney. Sherman explains in his book that “doing your own divorce” doesn’t mean you can’t work with an attorney. What it does mean is that you take responsibility for your case, your decisions, and your life. You think things through and make informed decisions. If you do use an attorney, you keep control of your case and do not just helplessly turn everything over to him or her. Sherman shows you how to do all of this, and how to use an attorney effectively, for minimum cost, if you decide to do so. For over 40 years, Ed Sherman has helped millions of people get better divorces. A family law attorney since 1970, Sherman founded Nolo Press in 1971 with his famous book How to Do Your Own Divorce in California. He is the author of 12 other books and three divorce software programs, and has sold over a million copies. In 1989, Sherman co-founded Divorce Helpline. His proven techniques have led to more than 46,000 divorce cases that settled successfully out of court. 1. Minimize your involvement with courts and lawyers. By understanding Texas divorce laws, applying Sherman’s practical advice when making decisions, and learning how to do your divorce paperwork, you can avoid most of the problems people have when entering the adversarial legal system. The legal process, and the way attorneys work in it, can cause trouble, raise the level of conflict, and greatly increase cost. If you don’t want to do your own paperwork, you can get someone to do it for you inexpensively. 2. Take charge of your own divorce. If you stay in control, you will get a smoother, faster, less painful and less expensive experience. You might want to get advice from a family law attorney who practices mediation or collaborative law, but you should not retain an attorney to take over your case unless you have a very good reason to do so. There’s a big difference between retaining an attorney and just getting advice from one. You will pay the price if you don’t know the difference. Most people start out with a divorce that is either fairly simple, or could become simple if handled right. Such cases don’t stay simple when you retain an attorney. When you retain an attorney you hand over your power to act. Divorce is a sensitive situation, and it doesn’t take much to stir things up if not handled correctly. Lawyers and the legal system, by their very nature, tend to make things worse, and more complicated. 4. Skip the most expensive steps and go straight to the inevitable end. When one spouse retains an attorney, the other is likely to do so too. Two attorneys start off costing just double, but then they start writing unpleasant letters, filing motions, and using legal tactics that may not be helpful. Now you have a contested divorce, more fees and a couple of very upset and broke spouses. In the end, 90% of all cases settle without trial, by agreement between spouses; but when you retain attorneys, settlement usually comes only after the spouses are emotionally drained and their bank accounts are exhausted. 5. Take the easy route. • By agreement—the parties agree in writing on property, debts, support and parenting. The best and easiest way is if you work things out in written agreement. The hardest way is where you or your spouse get an attorney and up in an expensive legal battle. The Texas Legislature meets every other year, on the odd-numbered years, and makes changes to divorce law while in session; so Sherman updates his book accordingly on those years. 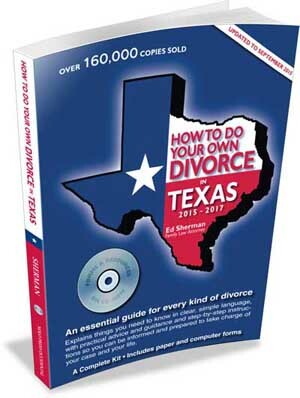 The 15th edition of How to Do Your Own Divorce in Texas contains the changes made in 2015, and is valid from September 2015 through August 2017. For more information on the current edition, visit How to Do Your Own Divorce in Texas. Sherman also provides a free divorce checklist on his site, at Divorce Checklist.